It’s been a while since my last episode of “Nuremberg Explored”. 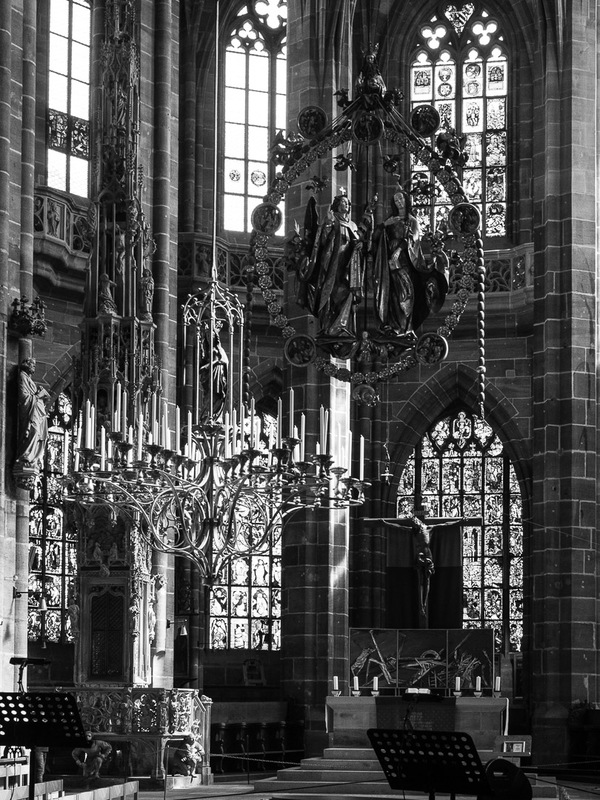 With the introduction to the “Angelic Salutation” by famous German sculptor Veit Stoss from 1518, that is one of the masterpieces in Nuremberg’s St. Lorenz Church, I’ll send you in a hopefully sunny weekend. For facts about this artwork and some more photos from inside St. Lawrence continue to read after the jump…. The Angelic Salutation is a assembly of lime wood sculptures. 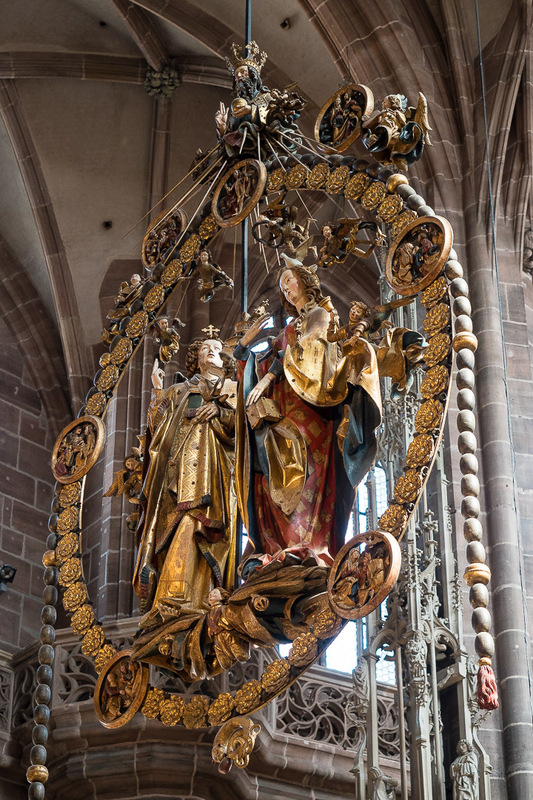 Veit Stoss created it for the medieval church of St. Lorenz (one of the two principal churches in Nuremberg’s Old Town) where it hangs on a metal chain in the center of the choir. 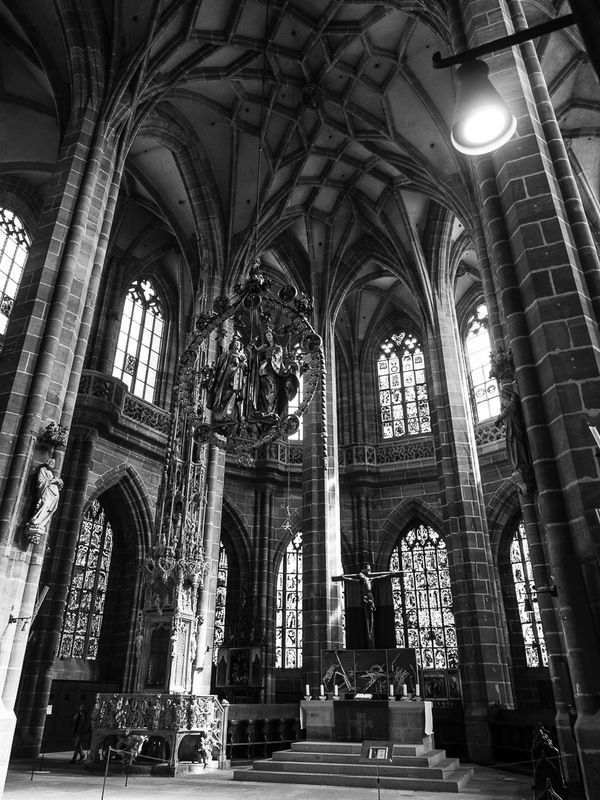 It was commissioned by famous merchant Anton Tucher, and local Renaissance hero Albrecht Dürer reviewed the masterpiece featuring Virgin Mary and Archangel Gabriel surrounded by small angels, many of whom are ringing bells in celebration or joyfully playing musical instruments. The statues are surrounded by a wreath of roses. 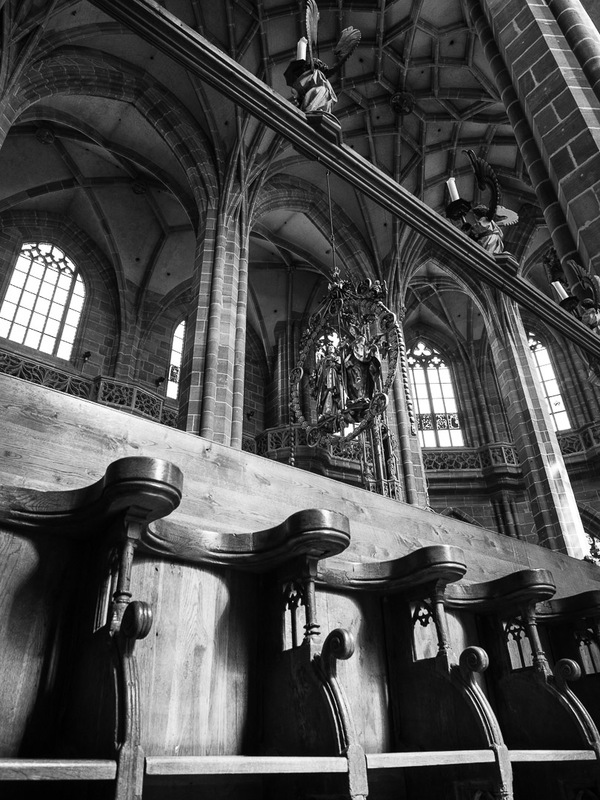 Soon after completion of the artwork the German reformation began and when St. Lorenz changed into a Lutheran Church the Angelic Salutation was only displayed on holy days and remained covered the rest of the time. This is also the reason why the colors are still very much in their original glory. 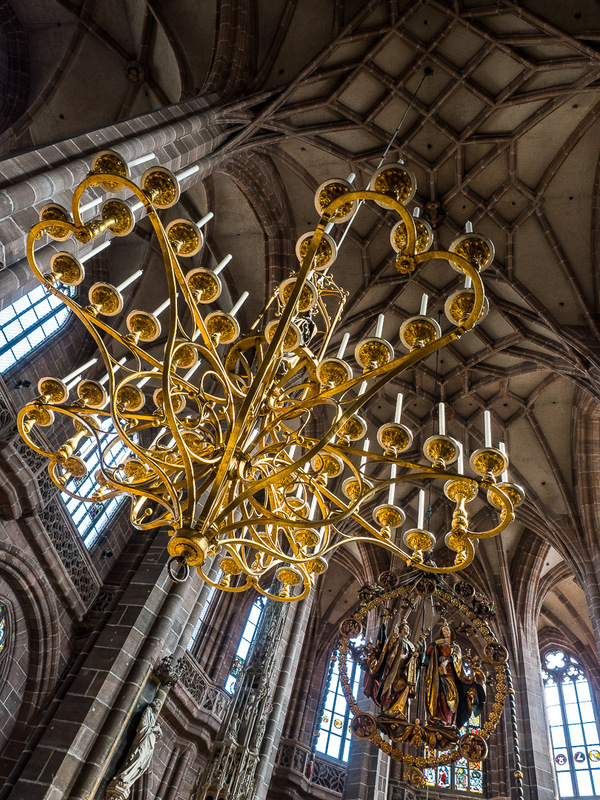 Because the work was deemed the private property of the wealthy and influential Tucher family and the city of Nuremberg was proud of its heritage this wood carved masterpiece escaped destruction during the reformation and today still hangs in this magnificent church. I wish you a great and sunny weekend! Thanks so much 🙂 ! Will continue to show off my city 🙂 ! So glad you like it 🙂 !! So schoen ,danke herzlichst für das Zeigen.Solche Bilder verschönern den Tag.Liebe Grüße.Ich wünsche das Allerbeste. Wow. Stunning. I especially like the B&W photos. Interesting commentary as well. Thanks, Lynne, glad we can share our impressions from those magic places. Excellent shots! The details of scupltures are amazing and well captured! 😎 Another place to add on my list of must see places! Thanks so much for your kind words, it means a lot!